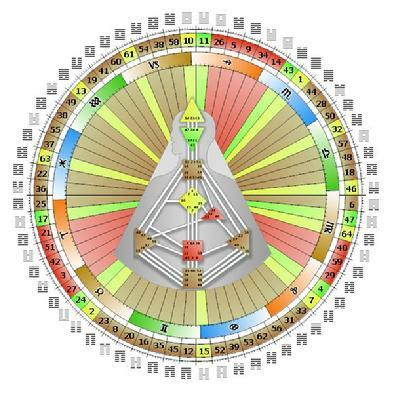 Human Design is a synthesis of several ancient systems, integrating aspects of Astrology, the I Ching, chakras, and the Kabbalah. It represents a map of human consciousness that links these old wisdom traditions to contemporary thought. It connects in particular to our modern understanding of genetics. A design chart is drawn up from your birth data. 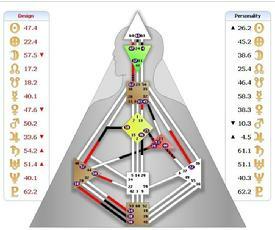 What emerges is a genetic map, a blueprint for your life journey. A reading of your design provides considerable detail about your true potential and unique place in the scheme of things. A Human Design chart looks like the illustration. We each have a unique design, just as we have a unique fingerprint. The premise of the system is that the universe has given you a design, because it needs you that way. The more you can trust this ‘belonging,’ the more carried (and cared for) you will be by life. 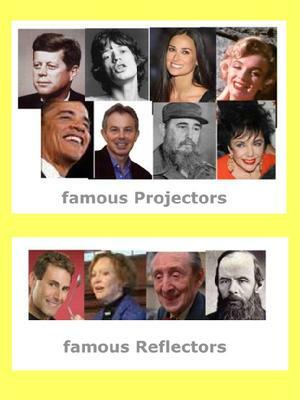 All our Human Design charts fall into broad categories. <?xml:namespace prefix = o ns = "urn:schemas-microsoft-com:office:office" />These are pure energy beings, with a built-in capacity to do what they want when they want to do it. Others are threatened (and jealous) of that access to energy and they meet resistance all around. Most people want to tie them down and not let them move with so much freedom. They carry anger from that constant blocking by others. The dilemma starts at a young age. Their strategy is really a public relations exercise. If they inform before they act, people around will feel included and considered instead of threatened. These are energy types with incredible stamina to go and go. The trick for them is to get involved with their considerable energy with things that are really for them and not let it get used up by other people. If they behave like a manifestor type and try and make things happen, they will get frustrated. Their power is in response. If they wait and let things come to them, their response will be a sure guide. They can trust a non-verbal, non-mental intelligence deep inside their cells, which knows where to go next and what to be available for. 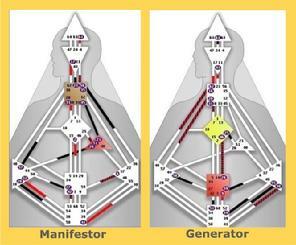 Manifesting Generator is a category of Generator. They get encouraged from an early age to use their manifesting power to make things happen. However their real power emerges from waiting and going with the flow. They have to learn to trust that their life unfolds with satisfaction when they don�t push the river. If they first engage their energy (or not) out of response, then they can move with a �go for it� speed and they won�t suffer frustrating anger. This is a non-energy type and their gift is that they understand energy. They need to wait for the recognition of others for their specific abilities. That appreciation acts like a red carpet, bringing out their abilities even more. They suffer bitterness because they often feel undervalued. 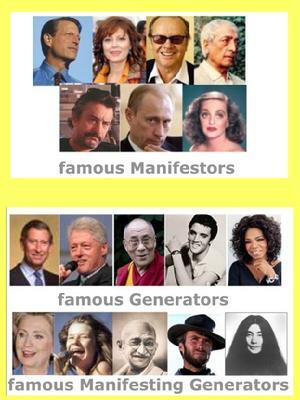 Once they relax and stop comparing themselves to the hard-working energy types. They get a chance to understand that they have an unusual ability to be guides for the energy types, and in that they can find their real self worth. The most rare of the four types, their design is very open and they carry a sense of communion with humanity. Since they take in other people very deeply and reflect back their energy, they are very senstivie to their environment. When there is lack of harmony around them, they can feel disturbed and dissappointed. They thrive in a loving atmosphere. Their design changes with the cycle of the moon. They need to take time (28 days) to come to a clear decision where major life changes are concerned. Expression and actualization, it is the hub where everything converges. And because we�re both, in the quantum we�re more than both. When centers in a chart get colored in, it means they operate in a consistent reliable way. Since they indicate a fixed capacity that is always accessible in the same way (day in and day out), they offer a way of describing to a person their nature. This is what they are born with and that does not change, it is a representation of �who they are�. Your nature isn�t your life; it�s what you can trust to guide you through life. The white areas in a chart are where nothing operates in a fixed way, they are �who you are not�. This openness is where we are conditioned in terms of nurture. That nurture can be positive or negative and the learning process is to be able to evaluate the difference. That filtering capacity of others� fixedness can form the basis for wisdom. A reading will propose an experiment to the mind to see what happens when decisions are made according to the nature of your mechanics. The colored centers (or not) indicate the type of design and the basic decision making �strategy�. Then there are various centers which can be the place of a final �yes or no�. This is called the �inner authority� and it varies with different charts. The experiment takes time; the mind needs to gather the evidence before it relinquishes thinking its in charge of the life. Each one of us is a cell within the larger body of the universe. We uniquely filter different aspects of the whole, though we are all born within 64 archetypical influences. These are known as the Incarnation Crosses. No incarnation is more important than another; we each have a specific purpose, the whole needs each cross equally. 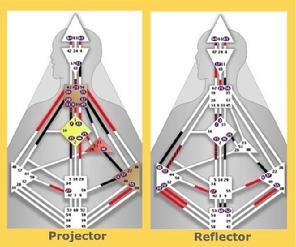 Centers are hubs of energy and information. There are 9, and they structure the bodygraph matrix. 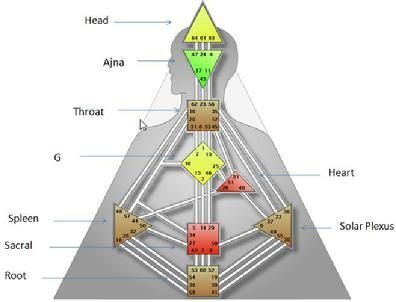 Gate is the name given to how the hexagram numbers appear on the bodygraph. Hanging Gate is an activation in the chart that hangs from a center to fill half a channel. Lines � there are 6 specific frequencies within a hexagram, these are called the lines. Profile is terminology for what is known as the costume for the life. It�s part of the learning to grow into the costume so that it fits well. As the hexagram numbers are listed, there is a second number after the full stop, e.g. 33.6 or 27.3, this is the line number for any given hexagram. The lines for the Sun and Earth at the top of each column will denote the profile for a given chart. The system originates from a revelation that came on the planet in 1987 in the form of a mystical experience. The man who received this information was given the title Ra Uru Hu.. He describes that he was penetrated by voice for seven days and nights. He began to teach extensively in 1992. The formidable reputation of Human Design for a penetrating accuracy has been growing worldwide ever since. (He died in March 2011). What if I don�t know my exact birth time? If you have a ball park birth time like morning or evening it is nearly always possible to pin down the time. If you have absolutely no idea of time, it is possible to run a series of charts for the whole day, and from that to establish a birth time. In both cases we would need to have a clear discussion in order to mutually agree on the proposed time.